The fishing report below is made available from the Central New York Fishing Hotline for December 15 through 22, 2017 at http://www.dec.ny.gov/outdoor/9218.html. Please visit that site for more information or to follow links. Reports will be harder to come by because many anglers have pulled their boats for the season, so there will likely be few changes to the report in the coming weeks. We are in that in-between period when we are awaiting safe ice, so there is little to report. With the cold weather in the forecast it shouldn’t be too long, though. A reminder that from Nov. 1 to May 1, all persons aboard any pleasure vessel less than 21 feet long must wear a Personal Floatation Device (PFD) while underway. 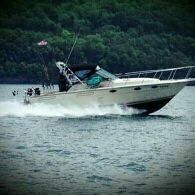 For more information on boating regulations please view the NYS Boater’s Guide. A link can be found in the righthand column under ‘Links Leaving DEC’s Website.’ Also, as a word of warning, many of the dock structures at the DEC boat launches will be removed shortly, or may have been removed already. So, please plan accordingly. Also, as a word of warning, all the dock structures at the DEC boat launches have been removed. So, please plan accordingly. April 1 was the start of the new Freshwater Fishing Regulation Guide, April 1, 2017-March 31, 2018. You can obtain a copy from a licensing agent or view it at Summary of Freshwater Fishing Regulations. Atlantic salmon and brown trout fishing has been good in the tributaries. Just a reminder that Finger Lakes tributary fishing is from sunrise to sunset this time of year, angling is prohibited between sunset and sunrise. The DEC launch has been closed for the season.